Everyday symbols and parables are so valuable in remembering important lessons in life. Jesus frequently used them in His teachings. I was reminded of their importance in the past 24 hours. 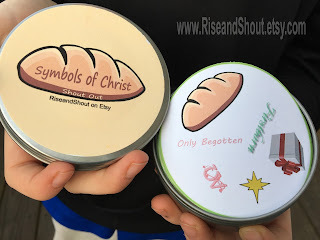 Last night we played "Symbols of Christ" Shout Out, and this morning as I made school lunches, I reflected on why Christ was called the 'Bread of Life.' Then as I brushed my wiggly 2 year-old's hair, I thought of the many ways that Jesus is 'the Head.' When I sang ABC, I pondered on how He is the "Alpha and Omega" (A to Z). Common objects helped me grow closer to my Savior today. What symbols of Christ help you remember Him in your everyday life?